Looking for a software partner to secure your next IoT project? Struggling to find answers related to IoT software security? Architecture development and integration? 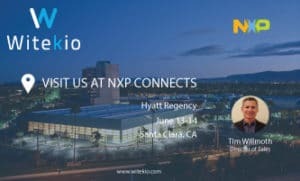 Visit and discuss with Witekio IoT software security experts at NXP Connects, June 13-14 2018, Santa Clara. Ever wanted to know what will be the next generation of software security technologies for connected devices? Do not seek any further! Register now for our panel ‘’The future of Security for IoT Devices’’, Wednesday 13 – 11:45AM. During this panel, we will highlight how new technologies like blockchain or Unikernel. They have been game changers in the datacenter world, will likely break into the IoT world and the benefits they might bring to microprocessor-based IoT devices. After providing a brief introduction on Security for IoT devices including an overview of the currently available technologies, we will present how blockchain may be used to enable decentralized ways to exchange trusted data between IoT devices. We will also present how UniKernel might be used to drastically reduce the attack surface of IoT devices and increase their overall security level. Finally, the attendees will learn about how intrusion detection systems can solve the problem of protecting your existing infrastructure against unsecured IoT devices. Try out how complete software design, hardware to Cloud software architecture and NXP i.MX6 Linux BSP customization can lead to this miracle beverage. 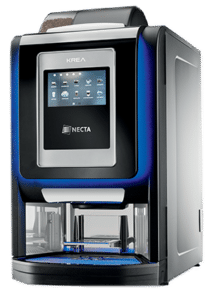 Witekio collaborated with Evoca on the development of a new vending machine based NXP i.MX6 DualLite, with a complete system integration service approach, including both low and high-level software development. One of the key requirement of this project was to design an intuitive Qt user interface granting a rich and innovative user experience. One other key aspect of this project was to develop a standard base code shared across all Evoca’s coffee vending machines. Learn more about this software coffee directly by clicking here. Witekio stands for software expertise, only software, just software. Software is key and is at the center of any technological systems and represents the marrow of any IoT devices. Witekio’s international team brings expertise into software design and development, Cloud software architecture and secured software solutions. Our software technology readiness combined with our cutting-edge software expertise is what helps Fortunes 50 customers like 3M, L’Oréal, accelerate software projects into IoT software projects success. Click here to discover what a Global Software Partner clearly do.